Applications: This machine can be used with inflatable or ventilated wheel driven grinding and sanding sleeves, belts and brush wheels to grind, clean, blend, satinise, surface finish and polish. It is suitable for work on most metals as well as wood. It can also drive belts for tube finishing. Product Notes: Consists of an industrial strength working head driven by a variable speed 1,200-3,200 electric motor. The drive shaft is double bearing mounted for strength and durability. Can use standard closed belts, or for added flexibility, Cibo-grip open belts can be used. Drive wheels of either a softer inflatable type for graining and finer work, or a rubber-flapped ventilated wheel for firmer application can be applied. A full range of brush and polishing wheels (125mm diameter, with M14 thread) are available. Larger diameter 5 inch wheels give much improved finish quality without judder marks. Much longer abrasive wheel and sleeve life due to larger circumference. Excellent variable speed characteristics giving a high torque at low speed - important for fine and mirror finishes. For kit options, please click the More Information tab. 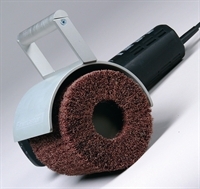 Also Available: A full range of accessories and consumables is available including: inflatable wheel, abrasive sleeves, flap wheels, polishing brushes.